Eight days ago my six chickens came to live with us. They have all been named - in spite of dire warnings from people who eat their chickens after they stop laying eggs. "Don't name them or you won't be able to eat them", they said. I named three of them that first day. Within a week, they all had monikers based on appearance, personality, or personal request from friends. None of them will be eaten. I'll have to open a chicken hospice at some point, because nobody is going to eat my chickens. Mamba is the dominant. She calls the shots. She is the smallest of the bunch, has one toe that is crooked, is black with some lovely dark brick colored markings, and can control the others with a couple of rapid pecks to a head or neck. Shiela is the least dominant. She is solid blonde, very pretty, and named after my boss. I'm not sure how my boss would feel knowing I have named a chicken after her and can only hope that she doesn't spend time reading blogs or facebook and find out that way. I might have some explaining to do. One of my two pretty Americauna breed chickens is named Marge, after my mother. Marge screamed bloody murder the first time I picked her up. This chicken has a set of lungs on her. My mother could astonish her two daughters with the decibel levels of her admonishments, so it seemed only right that she be remembered, and honored, this way. One of my Rhode Island Reds is named Rhoda. The other Red is named Mary Jane at the request of a friend at work (whose name is Mary Jane). The second Americauna is named Winnie after Winnie the Pooh. My sister chose that name. I love my chickens. After two nights of being carried to their coop (after much chasing, peeping, pooping, squawking and wing flapping) and three nights of being restricted to their condo, they now know where they are supposed to sleep. They do not file sedately up the ramp to the door of the coop. They wander in and out, pecking at each other and pushing each other out until they finally settle down. 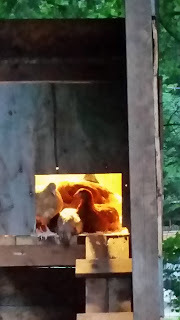 The peeping and jostling for position ceases after 15 minutes or so and then I unplug the overhead light in the coop so my girls can get some sleep. They need their beauty rest for days spent pecking, scratching, grooming, digging, leaping straight up into the air, chasing each other and pooping everywhere. They're delightfully entertaining. And now, it's time for bed. For as long as I can remember I have wanted to raise chickens. It wasn't practical (or possible) when I lived in southern California (36 years). Either I lived at the beach - no chickens allowed - or in the mountains in houses perched on the sides of steep drop-offs. No room, or time, for chickens. I lived in Alaska for five years after leaving California. Nursing school and sub zero temps prohibited me from interacting with any chickens other than those I found in the meat section at the local grocery store. Now I live on my sister and brother-in-law's property in the greater Seattle area. My husband and I parked our 34 foot motor home behind their house over a year ago and we haven't moved it since. Linda, my sister, and Art, her husband, have a house on a nice sized chunk of land. They have created a large garden where once was grass and this summer I have taken care of the fruits and vegetables growing here. Several weeks ago, we began to "talk chickens". The people next door and those who live across the street have chickens. I say God bless the zoning laws in this area. Art and my great-nephew Kyle tore down an old play area in the yard and began the arduous task of constructing a coop. They used the wood that had been a sort of playhouse to build the coop. Art can build ANYTHING, eyeballing the space and imagining the finished project. They worked tirelessly on 90 degree days, hammering and sawing and, occasionally, swearing. On the final few days of construction my husband stepped in and helped. Two days ago I knew that what has grown to be"a deluxe chicken townhouse" would be ready for occupancy today. I drove home from work this morning and realized that I was very, very nervous. A dear friend and I had made a date to drive to "the chicken store", and she and I left at 10am. When we returned home at noon, we had 50 pounds of special feed, a bag of "grit" that chickens need to digest their food, a large plastic contraption to hold water for chickens, a bag of probiotics to add to the water, a large bale of chicken bedding, a block of something that actually smells good and is a concoction that serves as "chicken treats", and a special feeding container. We also had six three-month-old chickens tucked into a large cat carrier. 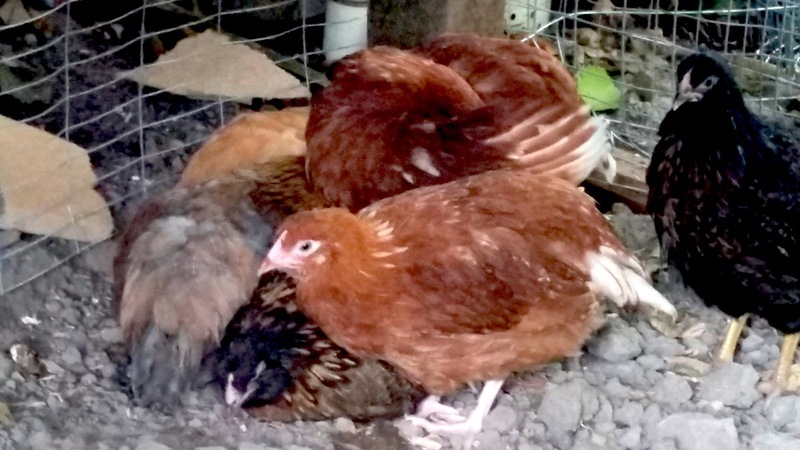 I had planned to purchase breeds of chickens that are good egg-layers. I was going to buy two of each of two breeds. I ended up buying those four and two that were too pretty to pass up. My chickens spent the day getting used to their surroundings and digging up items including a very, very old empty pack of cigarettes. They pecked and chatted with each other and dug and rolled in dirt and ate and drank with great vigor. Then it came time for me to introduce my girls to their coop - an insulated (thank you, Art) haven at the top of a long steep ramp. My chickens were not amused. They were perfectly happy digging for cigarette packages. There was considerable chasing and dodging involved, but I managed to get all six chickens into the coop where they paced and pecked at the walls, wide-eyed and skittish. I stood at the coop opening and talked to them in a low voice until they settled down and then I began to pet them. One of my Rhode Island Reds actually fell asleep with her head on my hand as I gently stroked the feathers on her back. It's dark now, but I'm fairly certain they're all asleep now, perhaps dreaming of the eggs they will lay in that coop. And I have placed a check mark next to one of the items on my bucket list, one that I was pretty sure I'd never achieve. Life is full of surprises, and some are wonderful. In 14 days, give or take a day, my husband and I will push our four apprehensive cats through the slim door of our motor home and drive away from Anchorage, Alaska. Early on our second day of travel we will cross the border into Canada and travel east and south until we reach Brier, Washington. My sister and her husband live there, as will we until we find a home of our own nearby. We have lived in Alaska for almost five years. It was my dream to live here, and my easygoing husband followed my heart. I lived in a tiny, spectacularly picturesque town for nine months, another quiet, pleasant rural community with triple the population of the first for two years, and the metropolis of Anchorage for most of the last two years and three months. Much has changed for me, so much. I have become a Registered Nurse here, while my husband has built a career in retail. I have fully grieved my mother's death here. I have lived my dream. I am among the lucky who somehow manage to have their grand adventure, their "someday", and I am very grateful for that. My bucket list was carefully constructed before we arrived five years ago. On it were a number of items, all of which have been satisfied. I have touched a moose. I have watched the aurora borealis dance across the sky. I have stood a mere 30 feet from the face of a glacier. I have seen the bore tide in Turnagain Arm come in as an impressive wave. I have eaten a salmon fresh from the Kenai River. I have seen Denali, the highest peak in North America. I have seen a bear or two. I have experienced the summer solstice when it really doesn't get dark at all for 24 hours. I was here for a record breaking winter - snowfall of nearly 11 feet. I would have been satisfied if the items on that bucket list had been checked off, one by one, during my stay in Alaska. Those sights, sounds, tastes and experiences were all they I had dreamed they would be. As I contemplate leaving now, however, it was the unexpected and unpredictable that took my breath away and has settled in my heart. I was able to be of help to a dear friend who broke her leg shortly after we arrived here. She needed help, and my husband and I were able to fill that need. In turn, she created the most beautiful quilt I have ever seen for us. She and I picked out the material and the pattern together and every time I look at it I am happy. I run my fingertips over its perfect stitching, feeling the texture and contours of different fabrics and I feel like a millionaire. I met my cousin here for the first time in my memory. She remembers us meeting as small children, but I do not. I didn't realize that she lived in Alaska until my sister coordinated a meeting between us early in our stay here. That first meeting was like coming home for me. I knew her face in my soul. She and her husband showed us extraordinary hospitality and I fell in love with her. We have laughed so hard, shared so much, and bemoaned our mutual neurotic natures for hours on end. We have taken care of the other's pets, spent holidays together, been through health scares, retirement (hers), academic achievements (mine), and she has shown me a brand of unconditional love that took me completely by surprise. No matter how far from each other we live in the future, we will remain connected by a special bond. I cannot assign a name to it, nor can I describe how deep it goes. It is just what I have with my Georgia. I forged some friendships here that have been shockingly deep, most of them with classmates from nursing school or somehow associated with my activities in college, and some with people whom I have worked for the past ten months in my job as an RN at the Alaska State Psychiatric Hospital. My emotionally wounded veteran soul sister. My bright and shiny surrogate daughter and roommate. My hilarious, generous and irreverent fellow nurse and part time flight attendant. My shy and honorable biking and coffee partner. My rambunctious, wild, procrastinating friend who made it through our rigorous course of study always waiting until the last minute but getting it done nonetheless. I won't write about them all, but so many have left a mark on my memory. The nurses at my place of employment who either frightened me or inspired me into becoming a competent novice psychiatric nurse. Alaska has given me a lifetime of wonder, love, awe, and experience in five short years. I have loved being a resident of this wild and scenic land, and know that when we drive away I will feel certain that I was given the chance to squeeze every bit of life out of my time here. I also know that I will be moving toward new, deep, exciting, challenging adventures near my family in Washington and I am so excited about that. I think I grew up in Alaska, I think I became my authentic self here. And when we climb into that motor home in two weeks, the person I have become here is the one I'm taking with me. We escaped the cold, dark Alaska winter for a few days and are visiting my sister and her husband in their snowbird haven in Tucson. They live just north of Seattle and fled the wet and darkness there for three months. They rent a "park model" in a development that caters to very active people over the age of 55, and my sister loves it. My brother in law is not fully committed to three months away from home every winter, but my sister is working on him and I suspect that he will succumb. I've probably been to Tucson before, but it was years ago during my misspent youth and I remember nothing about it. I don't like hot weather, so it would never have been on my list of places to visit. It sits practically on the Mexican border and is most definitely, most decidedly desert. Having lived in California for many years and despising the heat there, nobody could ever have talked me into visiting a city further south and nowhere near an ocean. When we left Anchorage on Sunday morning I had cleats strapped on my shoes so that I could navigate the ice rink that is our driveway without falling and breaking a hip. When we left the airport in Tucson I stripped off several layers of clothing and looked at the big ball of fire in the cloudless blue sky, thanking God for Alaska Air miles. Since our arrival I have attended a class in water aerobics, watched my sister and a number of other people play "hand bells" (which has always sounded goofy to me but is actually quite lovely), gone geocaching for the first time in a long time, laughed hard, eaten too much, and slept on an air mattress that inexplicably loses air during the night so that either my husband or I have to get up and use the electric pump to re-inflate it. Several times every night. Yesterday I rented a road bike from a local shop. I love biking and haven't been able to take a good long ride in several months due to snow, ice, and darkness. Today I went for a ride. I found a lovely stretch of bike trail and rode blissfully in the sun for miles. Too many miles. By the time I returned to the resort, everything hurt. Sore palms (I forgot to bring my riding gloves), sore legs, and a back that hasn't spent time curved over handlebars in months. But, that is just the beginning. Bicycle seats are not friendly things - not road bike bicycle seats anyway. I've found that the best way for me to make friends with a seat is to ride a couple of miles per day for a week, then slowly add miles. My parts seem to get used to the seat when they are introduced to it slowly. By the time I dismounted from the bicycle this afternoon, I knew I was in trouble. I had very unhappy parts. They were downright infuriated that I had taken such a long ride. By the time my sister, her husband, my husband and I had dined at my very favorite restaurant, it was painfully clear to me that re-inflating a sagging air mattress would be the least of my problems tonight. We stopped at a pharmacy so that I might find something to quiet my screaming parts, and I encountered a very professional, compassionate male pharmacist who looked like he was 14. I am not a shy person by any means, but I found it difficult to explain my problem. He listened to me with a puzzled look on his face, and suddenly he "got it". He saved my life by suggesting a spray analgesic that his wife used after giving birth and a big jar of diaper rash cream. I suspect that when I ride again tomorrow, and I will, that I will ride a considerably shorter distance and that I will spent lots and lots of time standing on the pedals. Since you died I've considered myself successful during the holiday season if I can avoid hearing "Little Drummer Boy". For some reason I can tolerate every other carol but that one. I burst into tears when I hear it because it reminds me of you. I've been a nurse for six months now. Remember when I first told you I wanted to be a nurse? I was working in the dietary department at South Coast Hospital when, one day, I knew I was supposed to be a nurse. I started taking classes then, and I remember you were very supportive. But then I divorced my first husband and started using drugs and selling real estate and education just didn't seem as important. I thought about it again during that long stretch when Daddy was in ICU at that same hospital, but by that time I was way too deeply involved with finding my second husband to be in college. Then Daddy died and I spent the next ten years or so wrapped up in some really dysfunctional grieving and being mad at you because you got involved with another man. Virgil, our roommate and her daughter and I decorated our tree very early this year. It was before Thanksgiving, in fact. The thing is, it's so dark at this time of year in Alaska that the tree with a whole bunch of lights on it seems like a good idea after about November 1st. We leave the lights on all the time and I suspect we won't pull that tree down and box it up again until February. Some of your ornaments are on it - all those Hawaiian angels you bought while we lived there, and a couple that you made. I smiled when I hung them on the tree. We don't really celebrate Christmas with gifts. Not like we used to when we were all together. You always bought so many gifts for me, and I remember that even when I was 18 I was beyond excitement waking up on the morning of the 25th of December. You'd cook a great dinner, the house always smelled wonderful, and there would be Christmas carols playing. Daddy could never do too much because of his COPD, but you would bustle around and drink your toddies and then we'd sit down to "open". One by one we'd each open a gift, and ooh and aah over it, and you'd keep a list of who we needed to thank for what. It would always be warm in the house, and the sun would be shining because we were, after all, in southern California. Some years we were really lucky and could see all the way to Table Mountain in Mexico from your deck. That was some view. I can close my eyes and see the curve of the coast and the sunlight sparkling on the ocean to this day. That view is forever etched in my memory. So anyway, I'm writing to you this year to tell you that I forgive you. I'm a couple of years older than you were when Daddy died, and now I realize that you deserved to have a man in your life once he was gone. I've worked through a lot of anger about how you latched onto me when I was very young and treated me like your best friend, or your mother, instead of your child. I know about fear now, and I know you were afraid of being alone. I know you were afraid of all the uncertainty in life, and having enough money, but most of all you were terrified of being alone. I know it must have been very difficult for you to be a parent, because yours died so young and you had no models. You were, in essence, abandoned. Sometimes when I think about how difficult it was for me to please you, or get along with you, I still feel angry for a minute or so, but these days when I feel that hurt rising up in my heart I tell myself that you did the best that you could, because I believe that you did. I forgive you. Thank you for the nights you spent teaching me new words. Thank you for saving your money so that you could leave me enough so that I could leave California and go to nursing school. Thank you for teaching me how to be a good conversationalist, and a good hostess. Thank you for that day in the nursing home when I left your room and you called me back in just to tell me that you loved me. That was the first time you ever said it to me that I believed you. I think it was because I worked so hard those last six years you were alive - to make sure that you were safe and that your care was good - I finally believed that I was good enough and had made up for all the times I disappointed you. Wow, I've gone on too long with this. I'm just having lots of feelings and missing you terribly because now I can see through the fog of resentment and anger and look at the scared woman behind all that who made fabulous Christmases for her daughter. I heard the damn carol the other day, sung by a new group, and as I listened to their beautiful voices I smiled. I cried, too, because it was "that song", but the way they sang it was so sweet and smooth and full of joy that I think it sort of healed me. I think you know that, too, because I could feel you there while I was listening. I could smell dinner cooking in your oven and saw the light shining on the sea and you were there with me and we were really smiling at each other. Especially when they sang, "I played my drum for him pa-rum-pum-pum-pum, I played my best for him pa-rum-pum-pum, rum-pa-pum-pum, rum-pa-pum-pum...then, he smiled at me pa-rum-pum-pum-pum, me and my drum." I wonder where the term "getting your feet wet" originated? Is that the first stage of "diving in" or does it lead to "swimming with sharks"? As it relates to my first nursing job, I think it applies to both. I was hired "on call". That wasn't what I applied for, but it was what I got. I wasn't happy about it, and I regret that everybody knows that. I do tend to be up front about my disappointments, and I really wanted a full time permanent position on one unit with regular hours, vacation pay, sick leave, blah blah blah. What I got instead was a comprehensive education on how things work on several units specializing in different populations in a psychiatric hospital. Not only are the clients different on these individual units; the procedures are different. Equipment, paperwork and other items I use to do my job are kept in various places in the unit nursing offices - and no two units are the same. To make it even more interesting, two of the units are mirror images of each other, so everything is literally backwards. About three weeks ago I left work one morning (I work nights) and stood in the parking lot for a minute realizing that I almost, kind of, maybe a little tiny bit know what I'm doing on the job. It was a shock - the thought hit me like lightning. Scared the hell out of me. I'm in line for a permanent full time position and will probably interview for it this week. I'm looking forward to having a more normal life. If working nights in a psychiatric hospital can be considered normal. I'll know what nights I'm working in advance, every week, and where I'm working. I'll get to know my colleagues, and in some cases, my clients. I have my fingers crossed. I love holiday pay and vacation time and paid sick leave. A few thoughts about working nights. My body wants to be up all night and asleep during the day. It always has. I DESPISE having a job that requires me to be at work early in the morning because I cannot fall asleep before 1 am. So, I love working nights. I am particularly grateful for my open all night gym, and open all night grocery stores. I love not having to drive anywhere in rush hour traffic (such as it is in Anchorage). I am also grateful for an AA meeting that starts at 6:30 am. I can go to that meeting on my nights off, do a little shopping afterwards, then go home, watch some tv and go to bed. I've enrolled in an online college to start working on my Bachelors degree beginning November 1st. That will necessitate fewer hours of Tivo during the night, but I think I can live with it.